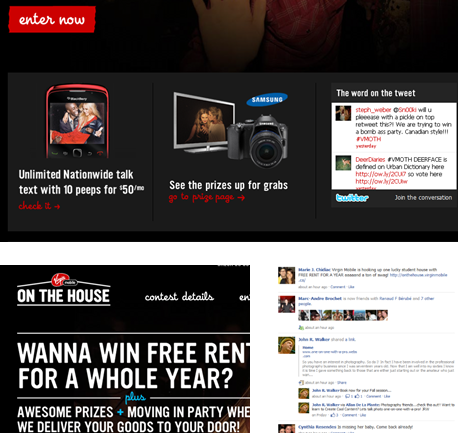 Virgin Mobile was looking to drive awareness and participation for the “On the House” sweepstakes. Students were given the chance to win free rent for a year. They turned to CI to leverage our network of social media ambassadors. We enlisted 200 social media ambassadors to promote the contest URL on their personal feeds. They posted FB updates multiple times per day with tongue-in cheek messaging. Social media efforts were concentrated over a 10 week blitz period to generate immediate traction. Over 180,000 impressions and 300 comments/likes were generated in a 10 day period, resulting in a significant spike in microsite traffic and contest entries.